In the 19th century many masters taught beginning students of sabre by utilizing a stick with or without a guard to protect the hand. The students learned manipulation of the weapon as well as body mechanics, in preparation for the use of the actual weapon. 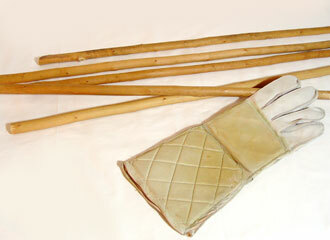 There were also systems of cane for self-defense using the gentleman’s walking stick and toward the end of the 19th and beginning of the 20th century systems of la canne as a combat sport. Maestro Acosta-Martinez has created a *unique system of stick fencing which is taught at Martinez Academy of Arms. Its purpose is to build a student’s understanding and physical application of fencing principles: proper form, distance, timing and self-control. This method was designed to serve as the foundation to pursue the study of other fencing weapons, cane defense, dagger or additional defensive arts.